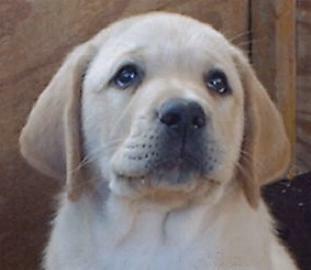 Yellow Lab puppies are the most popular color in the Labradors,. In the yellow color group you will see a wide range of yellows from a cream to a fox red. The cream are the lightest color and fox red being the darkest in the group. This yellow Lab puppy picture he is "Servant's Sundance Sam of Wells"
please do not take this picture, it is for viewing only. There are only three recognized colors of Labrador Retrievers and they are black, yellow, and chocolate.